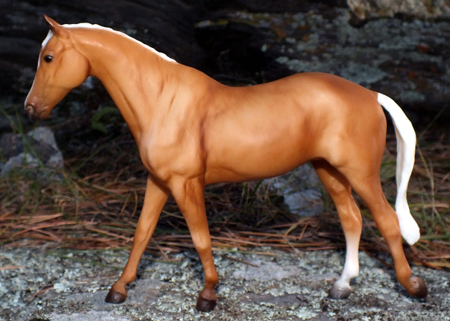 Palomino born in 1983. His sire Premium Skip has a ROM in Performance and Halter. He is also the 1982 Pacific Coast All-Around Cutting Champion. His dam-sire Sugar Vandy is in the NRCHA Hall Of Fame and a leading sire of Snaffle Bit Futurity winners. Her sire is the great NRHA Hall of Famer Hollywood Smoke. His achievements include AQHA World Show finalist in Senior Cutting and a Performance ROM with 36 points. He is sire of 1 AQHA World Champion, 11 Performance ROMs, 2-time AQHA Quarterama Cutting Champion, 1979 All American Congress Open Reining Champion, NCHA open Cutting Champion, NCHA COA earners. He is also the only horse to have sired 5 World Champion Reining Horses in 5 years.